“Let’s Go!” cry cheerleaders across America as they spur their team on to victory. Their athletics, upbeat attitude, and boundless energy can galvanize the crowd during a game. However, cheerleading squads don’t stop when the game ends — they continue to spread team spirit throughout the year, engaging their fans in numerous ways. They also conduct much-needed fundraising activities, and what better way to both engage fans and raise money than to sell fanwear in team colors. Varsity Brands, an international leader in cheerleading education and apparel, recognized the need for local squads to fundraise. In response, the company created Varsity Colors — a new division that allows cheerleading organizations to set up their own online stores and sell team-branded merchandise to their fan base. The customized e-commerce storefronts are free to set up and easy for busy team members to manage and track sales. Varsity handles everything on the back-end, including processing orders and shipping directly to purchasers. The company wanted to remove as many hurdles as possible, so custom storefronts could multiply quickly, allowing Varsity to increase their brand footprint in the custom apparel space. They also wanted to automate the process of tracking fundraising so that teams could reinvest funds back into Varsity products and services to pay for such things as uniforms, camps or competitions. In order to achieve their vision, the company needed an efficient, reliable, and highly-scalable solution that could grow alongside demand. Varsity partnered with Trifecta Technologies to design and implement a highly-integrated solution that leverages the company’s Salesforce instance as well as the power of the Heroku platform. Starting at the core of the Varsity Colors solution, Trifecta built a custom Force.com application that integrates with a Java application running on Heroku to manage Varsity’s master product catalog and access data from key internal systems (e.g. item SKUs, size charts, color lists, price lists and inventory). 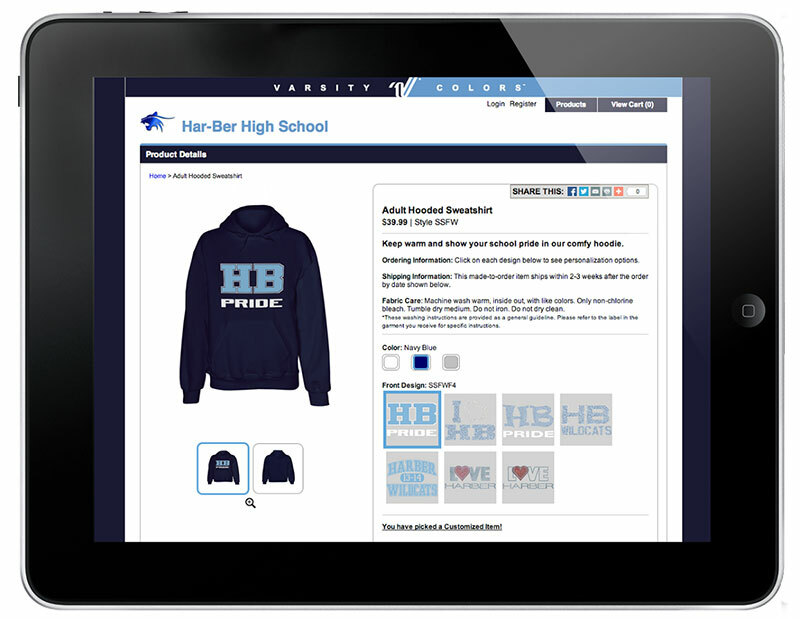 They designed a custom workflow that allows Varsity reps to request personalized team apparel for their select customers. Salesforce’s social collaboration tool Chatter was also integrated to facilitate internal communications, enabling Varsity staff to share ideas, troubleshoot issues, or simply improve organizational efficiency. Trifecta then developed a second Java application on Heroku that allows Varsity sales reps to easily design and generate customized team storefronts on demand, and then publish them to Heroku in minutes. A Java web application deployed on Heroku utilizes REST API calls to pull site details and merchandise updates from Salesforce’s enterprise cloud database, Database.com. Rounding out the solution are Heroku Add-ons, including: Rabbit MQ Bigwig for cloud-based messaging and SSL for encryption. The Varsity Colors solution integrates with key back office systems, including a legacy ERP, payment portal, CyberSource, and their custom .NET order management system (OMS). Trifecta built a DB2 integration database that sits between OMS and the back-end Java application, as well as their own custom web services that allow the app to talk to OMS. In addition, sales reports by store and product allow adjustments to be made to meet demand. Cheerleading squads work with their local Varsity sales representative to set up their store, defining parameters such as store open and close dates, product selection, and fundraising goals. 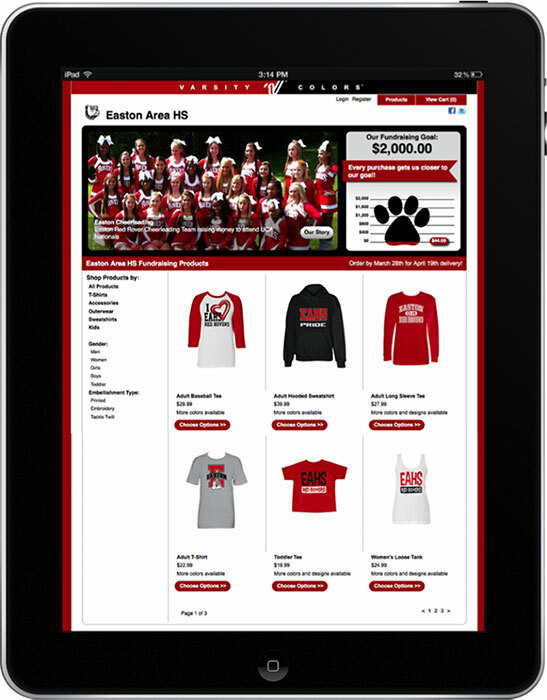 The Varsity rep can work with them to create unique looks for their apparel selections — including school colors, logos, and mascots — as well as help them dynamically design their team storefront using the Varsity Colors app template. Teams can log in to an admin tool to track real-time sales information, and the Varsity system can also send email alerts after every sale. Behind the scenes, everything else is managed by Varsity’s operations and customer service teams, including payment processing, shipping, inquiries, and returns. With Varsity Colors, cheerleading squads can now fire up their fan base at any time. Go Team! Does your company need a platform that can scale as fast as your portfolio of customized micro-sites? Varsity Colors is a great example of an integrated solution that can quickly generate and run customized storefronts on-demand. For more information, contact Heroku today. Since 1974, Varsity has been a driving force in making cheerleading the dynamic, athletic, high-profile activity it is today. By combining high-energy entertainment with traditional school leadership, Varsity has driven the development of an international phenomenon that now not only includes millions of young Americans, but also a rapidly growing number of participants worldwide. Varsity is comprised of the leading organizations and brands in various cheerleading segments, including it’s educational camps and clinics, competitions, and uniforms. For more information, visit: www.varsity.com and www.varsitycolors.com. For more than two decades, Trifecta Technologies has helped some of the world’s most widely recognized and successful companies unlock their true potential through the conceptualization and implementation of visionary business IT strategies. Leading companies worldwide trust Trifecta Technologies to help them maximize their investment in Salesforce, increase business agility and unlock unique insights into customer behavior. For more information, visit: www.trifecta.com.